Locavore | What did she do today? Lunch was so yummy I have to tell everyone about it! Butternut squash whipped with butter and milk, salt and pepper. Topped with local goat cheese, and Maple Almonds. On the side, Sourdough Onion Rings. Butternut squash was easy, I just peeled and diced the squash, boiled, drained, whipped it with some butter and milk until I liked the consistency. Added salt and pepper. For the Almonds I melted butter in a small iron fry pan, added almonds until browned, then drizzled with syrup and simmered until it got all caramelized and gooey. 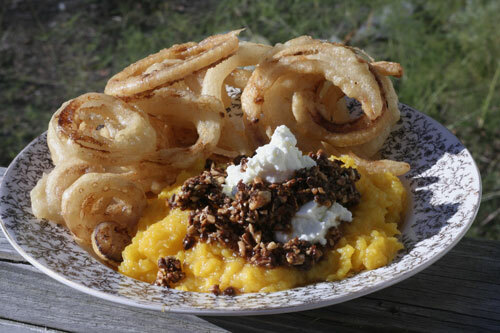 The onion rings…Melt Lard in a pan, about 1″ deep. Slice onion. Take some of your starter out of the container, putting it in a small bowl. 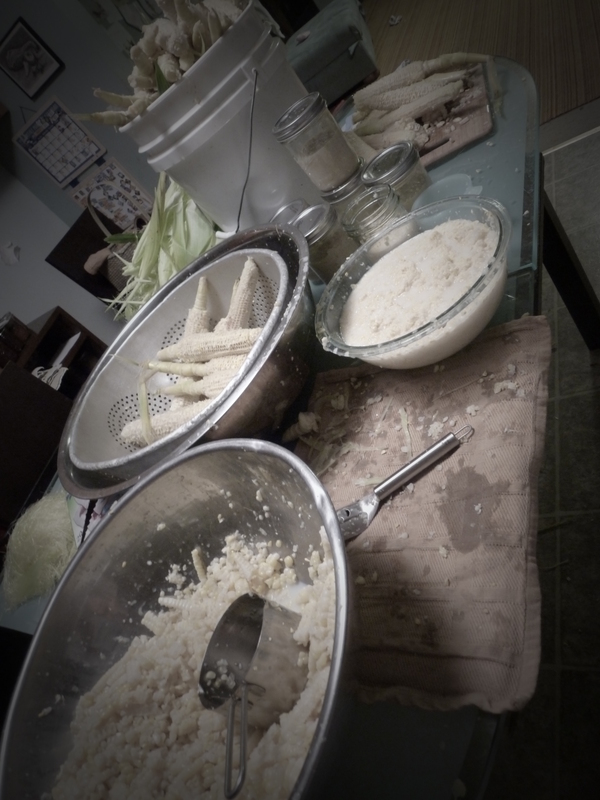 Dredge the onions with the starter and place in the fat. Once browned, flip, then brown second side and remove. I place on a cloth, sprinkle with salt and keep making more, piling and salting as I go. Assemble, admire, be thankful for the farmers who did all that work, and their plants and animals…then enjoy! Wake Robin Farm grows ginger each year and I make sure to pay close attention to which market they are bringing it to. Today was the day, so I left Declan with Nellie last night so I could skip milking…Life is going to be very different when he goes to the freezer…and I headed down to Portsmouth. I hit moments after another local ginger loving foodee, and we commented on her beating me, but there was plenty for both of us, so all was well. Most of this will find it’s way into the freezer, for use all year. Among my plans, Pear and Ginger Chutney, Lacto-fermented Ginger Carrots, Ginger ale, Ginger Infused Vodka, Ginger tea, and for a little something in soups or skillet dishes, or to flavor my kombucha. The tops are simmering on the stove, to create a nice base for soup. The ginger root is so tender I used it in my garlic press! Tonight I enjoyed a dinner of scrambled pork, with ginger, garlic, red cabbage and onions. A side of mashed potatoes, and some Nellie Milk. Mmmm. I love Fall! It’s October. Last year I realized of all the months of the year October is the busiest. I’m ready for you October. All the food is coming in, canning season is in full swing and there are lots of birds that are ready for harvesting. I’m working through my share of the crate of pears. Looking for Autumn Olives when I can. Scheduling butchering days with my friend. Trying to get the farm cleaned up and organized for Winter. Yes, there is a lot to tend to this month. Today the focus was corn! A local farm, Tuckaway in Lee, was offering pick your own corn for $3.00 a dozen! 25 cents an ear for fresh ORGANIC corn. Brilliant! I scooted over there with mom and Jessica and we all picked to our hearts content. I came home with 6 dozen. Most veggies are best right after picking. They contain the most nutrition and flavor they are going to, so last night, mere hours after picking, I shucked with the help of Christopher and the girls, blanched and removed the kernals on all but 6. Those will be for dinner tonight! The rest have been put into food saver bags and are in the freezer! I used a corn zipper to remove the kernals, and what a brilliant little tool that is. It takes off the kernals, then you can turn it around and use it to remove the little hearts and milk left on the cob. If you do that into a separate bowl you have harvested “cream corn”! So I have 9 pints of that frozen, too. On my way home from the corn fields I found a great Autumn Olive tree, that had a good amount of very tasty fruit! Awesome because this year is a bad year for Autumn Olives. My usual spot had some, but not many at all. It was disappointing. It’s unclear if they dropped fruit due to the very dry summer, if the birds are stocking up for the predicted hard winter, or what is going on, but my reports from friends and acquaintances all over the seacoast is the same. There are not many Autumn Olives to be had this year. So finding that tree was a great treat. The tree was clearly on someone’s property, so I drove to the house to ask if I could pick. I believe Stacy was quite sure she was encountering crazy, but at least not the dangerous kind. She gave permission immediately to this cheerful beggar on her doorstep sporting a long linen dress, hand knit sweater, bog boots, and a vintage hat. She did ask what an Autumn Olive was, at which point at a rate of speech brought on by the coffee I just drank which was not decaf…did I forget to ask for decaf? At any rate, I rapidly and enthusiastically started to explain what they were, the health benefits, what I did with them. She wanted to join me to see what I was talking about. And how I know she didn’t think I was dangerous, she hung out with me while I picked for about 15-20 minutes. But the amused facial expression makes me think she did tell her husband about me when he got home. She said I can pick from any of her bushes, which I will go back to see if any more have berries, since I picked from that one until dark. We did have a great conversation, really. She and her husband garden, so we talked about that, and where to find local food, and all sorts of fun things. Stacy will be receiving goodies, sometime in November. October and I still have many rounds to go, but all in all it was a first good day of the month. It’s fruit canning season for me. I missed peaches this year, due to a busy schedule, but I still have plenty canned from last year, and if I want to can some jam I have a couple bags of frozen peaches, too. Tomatoes were also canned last year to the point I had enough for 2 years, so no tomato canning happened this year either, except a batch of ketchup. What I didn’t have enough of this year was applesauce and canned pears. So this year they are the focus. I do like the idea of canning enough for 2 years at a time. This makes for a lighter load each year, because while you may be canning twice as much of one thing, it can all be done at once, so it doesn’t disrupt the rest of the schedule as much as tomatoes, then peaches, then pears, then apples… I will can pears and apples this year, then tomatoes and peaches next year. I hope to keep this sort of schedule going. We’ll see what happens. Last year I got such a great deal on peaches and tomatoes that it made sense to can 2 years at once, and this year I’ve found a great deal on pears. I guess next year the peaches or tomatoes could have a hard year, making it hard to get them, so I’ll have to can just one year…no way to know. 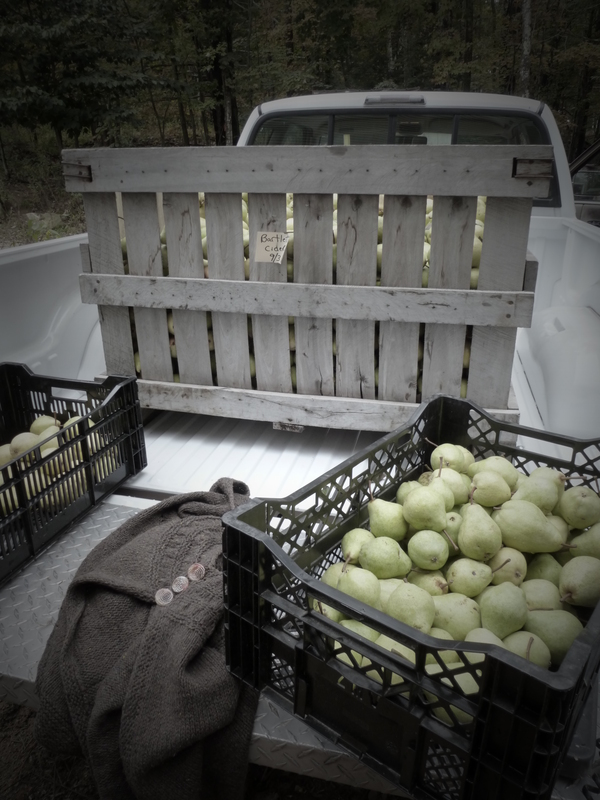 This year I was able to get a crate of pears, 800 pounds, that were seconds from a local orchard. Seconds was simply a size/appearance issue. They are just as yummy, and fresh, and very few of them were deformed, most were because they were too large or too small to be firsts for the farm stand. Fine with me. I’m going to peel and cut them for canning. I’m not processing all of them, I will be sharing with a couple of my preserving family and friends, but I will be processing 6 bushels, 300 pounds, if all goes as planned. I’ve made up 40 quarts of applesauce so far, and will likely can another 40 or so. I’m also collecting for cold room storage, and drying. Apples are a very important part of our family diet. Our girls love them. Yesterday, while I was peeling and cutting apples, Ewoyn was eating a bowl of apple sauce and raisins for breakfast, while asking if she could have an apple for desert. 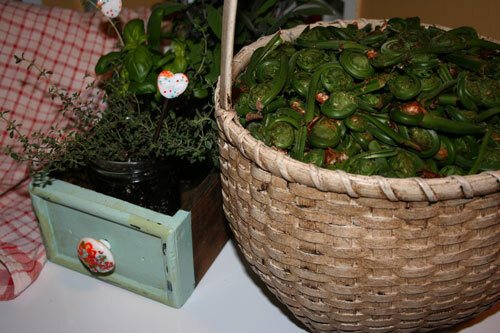 Fiddlehead season has come and gone in my little corner of the world. I picked a few days ago…wanted to go back two days ago but couldn’t…and this is what greeted me today. 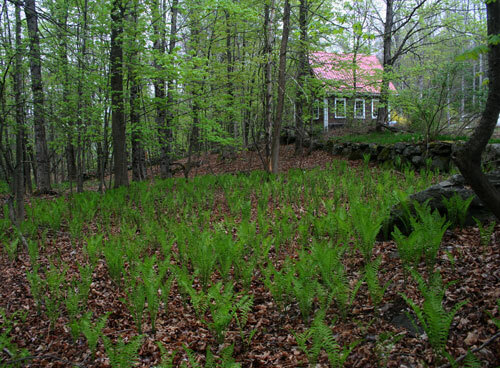 Very pretty, and I do love the smell of ferns, but not the greeting I hoped for. I was able to pick a few more, as some come up slower, but the picking is pretty much over. Next year I will do what I did last year and I will be going down every other day, to stay on top of them. I found a cute little idea on Pinterest…too many cute ideas, I’m on hiatus from that site for a little while…but anyway, I found a cute idea of taking an old drawer and some jars and turning them into an herb garden. I had the drawer, paint jars, oh and of course the incentive to make a knob and plant labels didn’t hurt. Thyme, Basil and Sage. They will head out to the garden when things warm up, but for now they do look awfully cute on the counter. I’m working on labels for the Fiddleheads, which are available, at the farm, for $4.50 per 1/2 pound bag…this is what I came up with. I let a Muscovy hen hatch out a clutch late last year…silly me. So today we butchered them. I’m excited to butcher them during a little slower time of year. In the fall all the butchering happens at once and there is so much to process and so much else to do, canning, closing down the garden, getting ready for the holidays, all on top of the rest of life (I do still have a full time job and a family that aren’t put on the shelf during the harvest season). All this to say that my butchering season is bare bones. Get them done, and safely packed in the freezer, leaving no time for a little fun…like sausage making! I always figure I’ll get to it when life calms down, but really, I don’t. Butchering these ducks, at this time of year has given me a fine opportunity to follow through! They are resting in the refrigerator tomorrow, and Saturday, I’m going to debone, grind and season. I’m going for bulk sausage, because that is what I like to use (I always strip sausage from the casing), and because that is one less step in the making. I’m definitely making some with sage, but I’m still researching options for the rest. There are 6 ducks, so a fair amount of meat. This is going to be fun! The rearranging has begun. There is Winter house and summer housing for the ducks and chickens. I pulled out some of the non breeding birds and put them in broody houses. I’m hoping to get them to start setting before my incubator crew hatches, so they can mama for me. We’ll see, but at any rate they do not need to be in the breeding coop. The duck breeds will be separated, and a new rooster is coming to spend time with a section of the hens, so he and his gals will get their own coop, too. I think one of my favorite parts of farming is the blank slate/open possibilities. There are many ways to do things and I love all the choices! Thank you Christopher (husband) for the video! This summer we will be offering chicken processed in an old fashioned way. We are dedicated to breeding and raising the Rose Comb Ancona Chicken. It is an endangered breed, and one that has so much history and potential, it would be a shame to lose it. 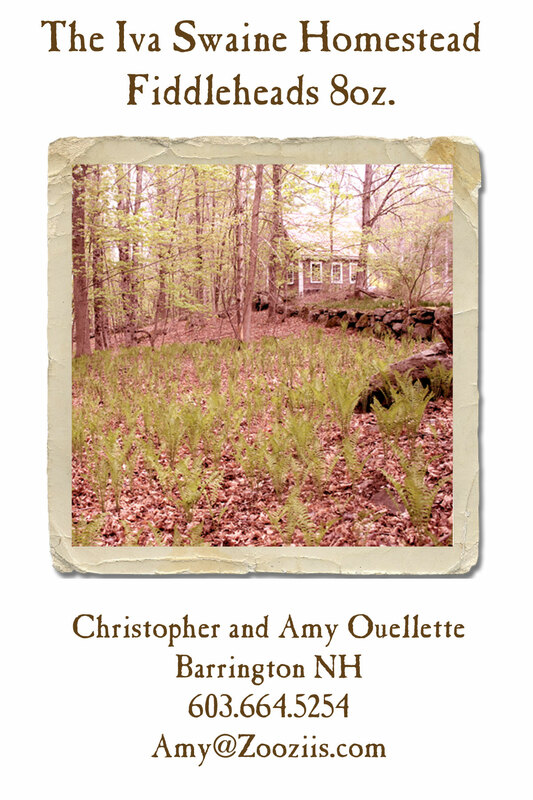 We procured our original stock from Yellow House Farm, and have bred them for a couple years. This year we will be hatching a large number, in the hopes we will be able to select a top notch flock of egg girls for the coming year. In breeding, at least with poultry there is a rule of 10. For every 10 birds hatched 1 will be great. The other 9 will be okay to good, but for the most part 1 in 10 will be great. If you want a flock of 12 great hens, you need to hatch at least 120 birds, and maybe more because you are hatching males, too. But you get the idea. To improve the flock you need to hatch a lot more birds than you need. On a homestead or small farm, trying to house 100-150 birds for 6 months could be challenging, in regards to space. This is where spatchcocking comes in. To spatchcock is to butterfly a chicken. When you butcher, you remove the back bone of the bird, which give you easier access to the offal on a small size bird. The benefit to the homestead or small farm, is that this can be done when a heritage bird is about 13 weeks old. So just as it’s starting to need more space and the testosterone would be kicking in creating a chorus of crowing prepubescent roosters in your yard, you are harvesting. The Ancona is especially well developed for this style of butchery because of it’s early maturity, so the meat has started to form well at the age of 13 weeks. A bird at that age weighs about 2.5 pounds, dressed. We find one bird to be just about perfect for our family of 4, and you could probably feed 5, if you were creative. The benefit to spatchcocking from a kitchen perspective, is the fact you can grill or cook at high temps a heritage chicken! Many people sacrifice the faster cooking techniques in favor of using a “proper chicken”. When a bird is 6 months old the muscles are well developed and they need to be allowed to cook slowly, and depending on the age, with enough moisture, so the muscles do not constrict and become tough. Because the spatchcock bird is so young, it’s muscles are still very flexible. This means you can cook them hot and fast! Grilling, broiling, frying, are all great techniques for the spatchocked chicken. The fact it doesn’t have a backbone allows it lay flat, making the breast and legs about the same thickness for consistent cooking. It is layed flat with a leg and a wing/breast on each side, looking something like a butterfly. We will be offering Spatchcock Ancona Cockerels this summer. I cooked one, from last summer, tonight, and I can’t wait for a freezer full of them! So tender, ready in 45 minutes and so delicious! Spatchcock Ancona Chicken with Bacon, on a bed of thinly sliced onions and minced garlic. Place garlic and onions in the pan, lay chicken (skin side up) over the onions and garlic, top with 4 slices of bacon. I put a little lard in the pan with the onions. Place in a 400 degree oven for 45 minutes or until the bacon and chicken skin are crisp, and the meat is to temp (165-170 degrees). I cut the chicken into 4 pieces, 2 thighs and 2 breast/wings. Side dish: Thinly sliced potatoes roasted in a pan with salt/pepper and lard/butter/duckfat, or other traditional fat. Roast for about 35 minutes until cooked and slightly crispy. Place chicken on plate, spoon potatoes, followed by onions and garlic from the chicken pan. Dice bacon, and sprinkle on top. Garnish with fresh, local greens or micro greens.